Steve has been involved with ALCA since 2001 when he joined the Board of Directors as the chair of Government Affairs. Since then, he has been Vice President, President, and chair of the Insurance and Safety committee. Currently he is the Treasurer. Steve graduated from Northern Arizona University in 1980 with a Bachelor of Science in Business Administration and began his insurance carrier with Argonaut Insurance. He left Argonaut to open Great States Insurance Company's first office outside of California. 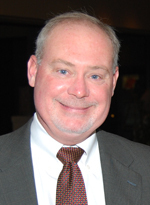 He joined Hill & Usher Insurance and Surety in 1999 specializing in commercial insurance. Steve is a second generation insurance agent in Phoenix and has actively participated on the Arizona Appeals Board and the NCCI CC&R committees. He is active in his Alumni Association in Flagstaff and Phoenix.